At weekends when I have a bit more time on my hands I like to prepare a hearty breakfast to keep everyone going all morning especially if we have a busy day ahead. This breakfast strata ticks all the boxes when it comes to being a satisfying crowd pleaser. I have used a combination of vegetables and meat to keep everyone happy and these can all be made and cooled and kept until needed the next day. Similarly the custard can be made the day before, covered and chilled in the fridge to all you have to do is assemble it in the morning. Get reading and discover your new breakfast favourite! 1. Start by heating the oven to 200c/180 fan if you are planning on preparing and cooking this straightaway; if not skip to the next step. 2. Take a large frying pan and heat a glug of olive oil. Fry the bacon until turning crisp then remove from the pan and blot onto kitchen roll; roughly chop. Remove the skin from the sausages and crumble the sausage meat into the pan and fry until golden; remove from the pan using a slotted spoon and also blot. 3. Use kitchen roll to wipe out the pan before warming another glug of olive oil. Roughly slice the mushrooms and fry into their excess liquid has been removed and they are starting to get some colour. Again, wipe out the pan and heat more oil. Sautee the onion and garlic until softened and add the shredded kale. Gently cook until wilted. Remove and set aside. 4. Clean the pan and rub with a little oil to stop the strata from sticking. Layer half of the cubed bread then add in all of the kale, mushrooms, bacon and sausages. Finish with the remaining bread. 5. Crack and beat the eggs into a large bowl. Add in the milk, cheeses and season well. Pour the entire mixture over the bread ensuring it’s evenly distributed. 6. Bake at 200c/180 fan for 30-40 minutes until bubbling and golden. The strata is ready when a skewer comes out clean from the centre of the pan. Allow to rest for a few minutes before serving. Breakfast strata- or lunchtime strata… or dinnertime strata! ‘Pigs in blankets macaroni cheese?’ I hear you cry! Why yes, you have indeed read the title correctly and I applaud you for making the most wonderful decision to click on it and read on to sate your curiosity. Now I love a Christmas dinner as much as the next, however, the trimmings are the best bit; think unctuous bread sauce, fragrant stuffing, bitter, yet most welcomed, sprouts and, wait for it, pigs in blankets. For this macaroni recipe I have taken elements of my favourite festive foods and melded them to make the ultimate festive indulgence so draw up your shopping list, fire up the oven and get cooking! 1. Get started by preheating the oven to 200c/ 180 fan. Wrap the pigs in blankets by winding half a rasher of streaky bacon around each cocktail sausage and placing on a baking tray. Allow a slight overlap as the bacon will shrink back a little when cooking. 2. Clean and chop the sprouts and place on a separate baking tray. I cut larger sprouts into quarters and left smaller ones in half but you can do whatever takes your fancy; slices also work well but remember these will need less cooking time. Toss the cut sprouts in the olive oil, season with a little salt and pepper and roast at the same time as the pigs in blankets for around 20 minutes or until tender and until the sausages are cooked through. 3. Take a small frying pan or saucepan and melt the 20g of unsalted butter ready for the shallots. Cook on a low heat on the hob until the shallots are turning a light golden colour; remove from the heat and set aside. 4. Next up goes the sauce! In a large pan melt the 50g of butter and add in the flour; cook together to form a roux. Gradually pour in the milk and cream and keep stirring so no lumps form; if they do, then remove the pan from the heat and whisk the sauce until the lumps disappear. Simmer until the sauce thickens and then remove from the heat before adding the majority of the parmesan. Season to taste. 5. When the sauce, sprouts, sausages and shallots are cooked and ready then combine them all and stir well to ensure all ingredients are well incorporated. Add to the cooked pasta and divide between 6 individual ovenproof dishes or 1 large one. Grate the remaining parmesan into the panko crumbs and top the pasta; for a twist, you could crisp up some extra bacon and also add this to the crumb mix which is delicious too. Bake for approximately 30 minutes or until golden and bubbling. Serve with a simple side salad if you like. Pigs in blankets and roasted sprout macaroni cheese- the ultimate festive treat! I recently fancied something Mexican inspired for dinner but we were a little bored of the usual options of tacos, fajitas and burritos; as lovely as they all are sometimes you need a bit of a change and this is where this recipe comes in. Quesadillas are toasted tortilla stacks that can be filled with a whole host of ingredients but this is a vegetarian quesadilla recipe. Black beans are often overlooked but are really quite versatile and I find are perfect for a quick recipe like this. The sweet potato is used to balance the earthiness of the beans and the mix of spices whilst adding a lift to the overall flavours. I served this as a dinner but I think it would also be great as a hearty brunch. In order to be able to use the bean chilli in a quesadilla it needs to be thick and a bit drier than you may usually make it if you were serving it with rice. So trust me and don’t be tempted to add too much stock otherwise it will ooze out of the quesadilla and make a right mess! 1. Start by making the chilli. Peel and cut the sweet potato into small pieces; toss with half of each spice and a good glug of olive oil. Roast in a pre- heated oven at 180c/ 160 fan for around 10-15 minutes until tender. Remove from the oven and set aside. 2. Choose a saucepan and add another splash of oil. Gently fry off the onion until softening before adding the garlic and cooking for a further few minutes. Add the remaining spices and cook for another minute. Squeeze in the tomato puree and, again, cook for another minute. 3. Add the drained black beans and sweet potato to the pan and stir well to coat the with the spice mixture. Pour in the majority of the hot stock as well as the dried chilli (if using) and fresh coriander; bring to a simmer. Cover the pan with a lid and cook on the hob for around 15-20 minutes. Pour in the remaining stock if needed and continue to simmer until the chilli reduces down and thickens. 4. As the chilli is finishing off you can make the avocado salsa. Simply prepare the ingredients as per the instructions above and combine in a bowl. Add a squeeze of lime juice and season to taste. You can add a little chilli and some more of the fresh coriander if you like. Cover with clingfilm and keep in the fridge until needed. 5. When you are ready to assemble the tacos, heat a non- stick frying pan over a medium heat. Place a couple of the small tacos into it ready to dry fry. Divide the chilli and spoon some into the centre of the taco; use the spoon to spread it out a little but not all the way to the edges. Sprinkle over some of the grated cheese before placing another of the tacos on top. Use a spatula and gently press down. Dry fry until the bottom is golden; carefully slip it using the spatula and do the same for the other side. Continue until all the tacos and chilli is used. Serve immediately with the avocado salsa. Black bean and sweet potato quesadillas- a perfect brunch or dinner to please a crowd! When the urge for a curry strikes it can be tempting to choose an Indian curry without giving curries from other countries a second thought so step away from the naan breads and give this Thai curry a go instead! The curry paste is straightforward and can be made in a larger quantity than is needed and it can be stored in an airtight container in the fridge so you then have it to hand for next time. I usually use medium red chillies in recipes so you have a gentle heat whilst being able to appreciate all the other ingredients but crank up the heat if you are so inclined! 1. Make your paste first by simply combining all of the paste ingredients in either a pestle and mortar or a mini food processor. Bring it to a thick paste consistency. 2. In a wok or deep frying pan, add another tablespoon of oil and gently fry the paste for a couple of minutes until it starts to release its fragrance. Pour in the coconut milk and stock along with the palm sugar and lemongrass; bring to a simmer and stir to ensure the sugar is dissolved. Add the chopped aubergine. Continue to allow it to simmer for around 15-20 minutes so the flavour develops. 3. When you are happy with the base of the curry, add the remaining vegetables in and simmer to cook until tender. When the vegetables are close to being ready then add in the prawns and simmer until they turn a blush pink. When ready, finish with a good squeeze of lime juice and a helping of chopped coriander. Yellow king prawn and vegetable Thai curry- because there are more colour curries than just red and green! Now I’m not usually a fan of salads with fruit in them but this little beauty has converted me! This chicken, prosciutto and nectarine salad is sure to become one of your staple summer salads when evenings are balmy, time is short perhaps or you’re entertaining and want a lighter option. The ingredients in this have been chosen to give balance; the salty prosciutto, the savoury cheese, sweet nectarine and some added texture from the toasted walnuts and it is all brought together with a dressing that could not be more straightforward so raid the supermarket and get cooking! 1. If you want to get ahead you can make the dressing in advance simply combining all the dressing ingredients and mixing together well; chill until needed. Next up crisp the prosciutto by dry frying the slices in a frying pan over a medium heat. Remove from the heat when the prosciutto is crisp and slightly golden and set aside. Pop in the walnuts and toast for a couple of minutes before also setting aside. 2. Wrap the chicken in clingfilm and use a meat tenderiser or rolling pin to hit it out so each breast is around the same thickness so they cook evenly. Rub the chicken in a glug of olive oil and season well. Heat a griddle pan to medium- high and cook each breast for around 4 minutes on each side until you cooked through and the juices run clear. Set aside and allow to rest. 3. Add another glug of oil in the frying pan that you had cooked the prosciutto in. Heat to medium and add the nectarine wedges; fry until caramelised but still holding their shape. 4. Take a large mixing bowl and toss the salad leaves with a little of the dressing so the leaves are evenly coated. Add the prosciutto, nectarines, prosciutto and walnuts and combine well. Slice the chargrilled chicken and add. Serve on a platter so everyone can help themselves and finish by dotting the cheese over the salad; drizzle with a little more of the dressing and serve. Chargrilled chicken, crispy prosciutto and nectarine salad- because sweet and savoury are a match made in heaven! From time to time most households have leftover bread that it heading past its best but there’s no need to waste it- that’s where panzanella comes in! Panzanella is a traditional Italian tomato and bread salad that’s full of fresh, seasonal flavours. There is no one panzanella recipe so this is my take on it. I included fried capers to give an added dimension and texture. Anchovies are also added to ramp up the savouriness but you can omit these if you prefer. Fried artichoke is also a welcome addition but not at all traditional however it adds a wonderful earthiness. For the perfect panzanella the tomatoes you choose are important as you want the freshest available. I have used a combination of smaller heirloom varieties which have become easier to find and add a range of colour. Panzanella makes a great light lunch or it can also be served with simple grilled meats for a more substantial meal. if you have any leftovers, you can simply baked the remaining pieces of bread on a tray in the oven until crisped and then serve with the salad- delicious! 1. Take your bread of choice and roughly tear it into pieces. Place on a tray and leave for around 20-30 minutes to help dry it out a little if it still relatively fresh; if not place on a baking tray, drizzle with olive oil and finely grate over from parmesan cheese; cook in a low oven until golden. Meanwhile pop the chopped tomatoes, peppers and onion in a colander with a bowl underneath and add salt and pepper. Leave to sit for half an hour so it draws some moisture out of the tomatoes and softens the peppers. 2. Take a small frying pan and add a small amount of oil over a medium heat. Fry the artichoke slices until golden and crisp; remove from the pan and pop in the capers and anchovy and fry until crispy. Tip the bread, tomatoes and onion into a bowl along with the peppers, anchovies and capers. Drizzle over the vinegar and oil; taste and adjust seasoning as needed. Finish with some freshly torn basil. Tear open each ball of burrata and serve. If you’re looking for a noodle salad recipe to take you through summer and beyond then look no further! In the recent warm weather that we have had here in the UK this noodle salad was perfect for a light but filling dinner. I have used beef here however feel free to play around with the ingredients as prawn, chicken or even crispy tofu would also be delicious here. The dressing can be made in advance to allow the flavours to develop if you have the time; simply make it, cool it and keep it in the fridge until you are ready to use it. 1.Start off by making the dressing; simply combine all the listed ingredients for the dressing and stir well. Place in a pan over a low heat and simmer until thickened; remove from the heat and set aside. Remember to taste the sauce to ensure that it is to your liking and then adjust if needed. 2. Soak the noodles as per the packet instructions; drain well and use scissors to randomly cut the noodles so they are easier to eat in the salad. 3. Heat a frying pan to high ready for the steak. Season the steak and cook to your liking. Remove the steak and rest for the same amount of time that it was cooked for. Use a sharp knife and thinly slice the steak. 4. Take a large bowl and combine the noodles with the carrot, beansprouts, radishes and the dressing. Add the sliced steak, peanuts and fresh herbs and toss well. Serve on a large platter, if you like. Let’s face it- who doesn’t love a good breakfast to start the day?! Well if this sounds familiar then this is the breakfast for you! This hash is absolutely packed with flavour and can easily be made for one, two or even a group; it also makes the most of ingredients that a lot of people will have in their fridge. In my mind, all good breakfasts involve an egg with a golden, runny yolk. Here I have chosen to bake the egg into the hash but feel free to serve it with a poached egg perched atop the hash if you prefer. 1.Preheat the oven to 200c/ 180 fan. Start off by deciding if you want to make individual hashes or one larger one and choose smaller pans or one big one. Heat a good glug of oil in the pan and add in the sweet potato chunks. Sprinkle over the ground spices and fry for a few minutes until the potato is softening and starting to turn golden. 2.Add in the chorizo, garlic, onion, red pepper and chilli; continue to cook until the vegetables are tender. Stir in the shredded spinach and combine to ensure that it is distributed evenly and starting to wilt. 3. Use the back of a spoon to create a well for each of the eggs to sit in. Carefully crack each egg into a hole and back for around 10 minutes until the egg white has set and the yolk remains runny. Serve immediately with a liberal sprinkling of the chopped coriander. Sweet potato, spinach and chorizo hash- now this is the way to kick off the day! If there’s one thing that is always welcome in the kitchen, it’s a one pan, no fuss recipe! Tray bakes come in handy when time is short and lend themselves to midweek meals so you can be sure to have something on the table with minimal washing up. This Greek style chicken tray bake makes the most of simple ingredients and uses a straightforward dressing so you really don’t have to put much thought into cooking so get chopping, set the timer and wait to dive in! 1.Preheat the oven to 200c/ 180 fan whilst you make sure that all the ingredients are prepped and ready to go as this really is a speedy meal to assemble once you get going. Take the chicken portions and coat in the honey and 1 tbsp of the olive oil. 2. Place all the remaining ingredients other than the feta in a deep baking tray and toss together. Arrange the lemon slices over the top. Pop the coated chicken pieces on top and cook in the oven until the chicken is cooked through and the vegetables are tender to a knife point. You will know when the chicken is ready when it is golden skinned and the juices are running clear- it will depend on the size of the chicken thighs but around 30 minutes is usual. When the chicken is nearly ready, sprinkle over the feta and put back in the oven for a couple of minutes to soften and warm. Serve immediately with a salad if you like. Greek style chicken tray bake- if you’re after a speedy but flavoursome dinner then this is for you! The festive season may well and truly be over but that doesn’t mean that sprouts need to be forgotten about until December. They are still in season and can continue to be enjoyed (honestly, they are a wonderful vegetable!) and they lend themselves to a range of simple dishes so banish any thoughts of them being boiled beyond recognition and get in the kitchen. This recipe is also perfect for using up any leftover blue cheese from your cheeseboard that may have been relegated to the back of your fridge. I used blacksticks blue cheese but use whatever you fancy as the flavour of sprouts can stand up to a variety of cheeses. 1. Preheat the oven to 200c/ 180 fan. Take a large frying pan and heat a small glug of oil. Gently fry the shredded sprouts and onion until they start to soften and then add the pancetta cubes so they have time to begin to turn golden. Remove from the heat whilst you make the cheese sauce. Cook your chosen pasta shapes as per the instructions and, when al dente, drain well. 2. In a suitable pan, melt the butter and flour together to form a roux. Slowly add in the milk and cream whilst you stir all the while to avoid any lumps from forming. Simmer until thickened and then add in the mustard and stir well to ensure it is combined. Take the sauce off the heat and add the blue cheese and majority of the parmesan, reserving some for the topping. 3. Tip the sprout mixture into the sauce and make sure it is evenly distributed throughout the sauce. Add in the drained pasta and place in one large ovenproof baking dish or four individual ones. Combine the remaining parmesan and breadcrumbs and top the pasta. Bake in the oven for approximately 30 minutes or until golden and bubbling. Serve by itself or with a simple side salad. Blue cheese, pancetta and sprout bakes- sprouts are for life, not just for Christmas! At this time of year I become borderline obsessive about squashes in all their beautiful guises and tend to become overexcited when new varieties come into the shops. Through the season I tend to use as many types as I can and come up with new ways to enjoy them and this recipe is no exception. The sweetness of delicate squash lends itself to being paired with the heady aromatic spices of the Middle East and all it needs is a drizzle of a simple dressing to bring it to life. Here is the recipe for the warm squash salad and it can be served either as the main meal or an accompaniment. It is delicious with pan friend lamb cutlets if you fancy. 1.Firstly I would make the za’atar mix so then it is ready and on standby for later. Simply take a small dry frying pan and toast the sesame seeds until golden and realising their flavour. Allow to cool and combine with the other ingredients; use a pestle and mortar or food processor to whizz them up and that’s all there is to it! 2. Preheat the oven to 180c/ 160 fan. Prepare the squash by peeling the skin using a speed peeler, cutting it in half lengthways and scooping out the seeds. Cut the squash into crescents and place in a deep baking tray. Peel the red onion and cut into wedges and add to the tray along with the garlic cloves (still in their papery skins). 3. Season the vegetables well. Combine the pomegranate molasses, oil and honey and drizzle over the vegetables; toss well to combine. Roast in the oven for around 15-20 minutes or until tender. While it roasts use a dry frying pan and toast the pine nuts. 4. Remove the squash from the oven and toss through the pine nuts and crumble in the feta. Sprinkle around a tablespoon of the za’atar spice mix and finish off with some freshly chopped coriander if you like. Serve immediately. Spiced delicate squash salad- bring the soft glow of autumn to the dinner table! Spicy Korean chicken really is a thing of beauty and indulgence but it can often be heavy as, more often than not, it’s deep-fried which does nothing for the waistline so this version is still just as moreish but a little better on the health front! Gochujang and gochugaru are Korean ingredients are becoming more accessible in the UK so it’s time to raid your local Asian supermarket to source the best ingredients that you can. The chilli paste, gochujang, and the chilli powder, gochugaru, are spicy but full of flavour. I have paired the chicken with a simple, light slaw. This really is the perfect meal to share with friends or to make for a lazy weekend dinner. On the off chance that there are any leftovers the chicken wings are also delicious cold the next day for a quick snack. 1. Get going with the chicken marinade in advance of when you want to cook them so the chicken takes on as much flavour from the marinade as possible. Simply combine all the ingredients apart from the toasted sesame seeds and spring onion. Place in a large bowl with the chicken wings, cover, pop in the fridge and set aside- ideally overnight but for at least an hour. 2. In the meantime the slaw can be made. Use a mandolin or sharp knife and finely shred the red and white cabbage. Grate the carrot and finely slice the spring onion. Add all the other ingredients together in a bowl and stir well to combine before pouring over the vegetable mix; toss well so it all gets an even coating. 3. When you are ready to cook the chicken, preheat the oven to 200c/ 180 fan. Place the marinated chicken in a large baking tray and cook for around 20 minutes or until the chicken is cooked through and the juices run clear. 4. To assemble, take a large serving platter and arrange the slaw. Top with the cooked wings, sprinkle over the toasted sesame seeds and spring onion and let everyone dig in! An extra squeeze of lime juice is also a welcome addition to give an added layer of zing. Spicy Korean chicken wings and slaw- a large stack of napkins is a must! Tacos and all things Mexican seem to be having a bit of a moment but they are often meat laden parcels of goodness however sometimes a lighter take on a recipe is much needed so this is where the halloumi taco recipe comes in. Halloumi is one of my favourite cheeses so I’ll use any opportunity to use it in my cooking, Not only is it versatile but is takes on flavour well, so marinade it ahead of time for maximum effect. I served the tacos with a cooling fresh salsa and a warm red pepper and chilli sauce which you can make more of and then use later in the week or freeze for another time. I used smoked chipotle morita chillies but feel free to experiment with different varieties of Mexican chillies to see what you prefer. If using dried chillies then remember to soak them in water in advance before using. 1. Start by preheating the oven to 220c/ 200 fan. Lightly brush the red peppers with a little oil and place on a baking tray or rack. Cook until lightly charred and soft. Remove from the oven and set aside until cool enough to handle. Carefully peel the skin and roughly chop the flesh. In a small pan, add a little glug of oil and fry the onion and garlic. Place the peppers and onion mixture into a food processor along with the chilli and whizz into a sauce. Season to taste and set aside. 2. Next you can sort out the halloumi. Simply cut each block into thick finger shapes so they hold together when fried. Combine the ground cumin, coriander and paprika with the oil and toss well to coat the halloumi. 3. For the fresh salsa, simply chop the avocado, onion and tomatoes. Combine and season well. Add a squeeze of lime juice to taste and the fresh coriander. Set aside. 4. Take a non- stick frying pan and heat a glug of oil over a medium heat. When hot, add the halloumi fingers and turn during cooking so each side is golden. Remove from the pan and blot onto kitchen paper to remove any excess oil. Then it is all a matter of assembly! Warm the tacos and arrange them on a serving platter along with the halloumi, salsa and roasted pepper sauce so everyone can help themselves. Serve with some freshly sliced jalapeno chilli and lettuce leaves if you like with a little soured cream on the side. Halloumi tacos- a lighter take on a Mexican classic! Chermoula is a Middle Eastern paste that is used in a range of dishes to add tang and spice to a range of fish, meat and vegetable dishes. You can buy it ready made if you are pressed for time but it really is speedy and straightforward to do yourself; you can make it in advance and keep it in the fridge until you need it. If it is covered then it will last for a few days if you want to make a larger amount and then use it for a couple of meals. 1. Get started by making the chermoula by simply combining all the ingredients either by hand using a pestle and mortar or a food blender to whizz it into a paste. Coat each of the pieces of cod and set aside to marinate. 2. To make the tomato and pepper base that the cod is going to be served on, add a good glug of olive oil to a large non- stick pan. Cook the onions until softened and then add in the garlic cloves along with a pinch of chilli flakes and continue to cook for an additional minute. Add the tomatoes, red peppers and olives into the pan and simmer until the sauce is thickening and reducing but so the olives still retain their shape. Sprinkle in some freshly chopped coriander to finish and lower the heat whilst you cook the cod. 3. Heat the oven to 200c/ 180 fan. Place the cod on a lined or lightly oiled baking tray and cook until the cod is cooked through. Serve on top of the tomato sauce and enjoy immediately. Chermoula cod- brighten up your day with zingy, fesh flavours! There’s an endless world of curries out there but sometime time is short but the need for a spice kick remains so this is where this speedy midweek curry comes in handy. I often prefer a vegetarian curry so this uses some of my favourite vegetables whilst being packed with flavour; you never know, it may even convert the most diehard carnivore! I have chosen vegetables that have distinctive flavours that can stand up to the spices so you can taste each element of the curry. Feel free to play around with different vegetable combinations- a potato based curry is always delicious! 1.Cut the paneer into equal sized cubes- you usually get around 12-14 cubes from an average block of paneer. Toss them in the corn flour. Heat a good glug of oil over a medium- high heat and fry the cubes until golden and turning crisp. Remove from the pan with a slotted spoon and blot onto kitchen roll to remove any excess oil. 2. Choose a large wide brimmed pan that is big enough to fit all the paneer and vegetables in. Heat another glug of oil over a low to medium heat. Fry the red onion until softening and turning a deep golden; don’t rush this as this will help the overall flavour. Add the onion seeds and fry for another minute. 3. Add the aubergine and pepper and continue to cook until the vegetables are softened and tender. Meanwhile, combine the spices plus the garlic, or garlic puree if you are using this instead, in a small dish with a splash of water to form a paste. Add to the pan with the vegetables and cook for a few minutes until the vegetables are well coated and the flavours of the spices are being released. Pour in the passata, stir well to combine and add the paneer chunks back into the pan. Simmer until the sauce is reducing slightly and clinging onto the vegetables. If the sauce looks too thick at any point, simply add a splash of water and carry on simmering. When it looks nearly ready, add the shredded spinach and cook for a couple of minutes until wilted. Serve with your choice of Indian bread such as naan or chapatti and a sprinkling of freshly chopped coriander if you like. Aubergine, paneer and pepper curry- a speedy curry for people in a hurry! If you Google ‘Montezuma’ you will enter into an ancient world and boost your knowledge somewhat but it will do nothing to sate your appetite. This recipe was born out of a fancy for an easy breakfast one weekend and making the most of a few ingredients that needed a bit of love which lent themselves to a Mexican inspired dish hence the slightly obscure name (got to be creative, right?). The hash includes flavours which are sweet, spicy and savoury to create a moreish meal that will certainly set you up for the day ahead. But why stop there? It would also be perfect for a light dinner. 1. Bring a medium pan of water to the boil and preheat the oven to 180c/ 160 fan whilst you peel and chop the potato into chunks. Add salt to the pan and boil until the potatoes are par boiled; drain and set aside. 2. Take a large frying pan that is large enough to fit all the dish in and that has an ovenproof handle. Heat to medium high. Dry fry the chorizo before removing from the pan and setting aside for later. Toss in the potatoes and fry them in the chorizo fat until tender and coloured. 3. When the potatoes are nearly ready, add the onion, garlic, ground coriander and ground cumin to the pan; continue to cook until the onion is softened. Return the chorizo back to the pan. Stir through the tomato as well as half of the green chilli and cook for one more minute. 4. Use a spoon to create two or three wells in the mixture and crack an egg into each. Bake in the oven until the egg whites are set but the yolk is runny. 5. Remove from the oven and sprinkle over the avocado cubes so they start to slightly warm through on top of the potatoes. Scatter the fresh coriander, remaining green chilli and paprika to finish. Serve immediately. Montezuma’s hash- a breakfast feast fit for a king! Jambalaya is a spicy Creole rice dish which makes the most of a range of ingredients from vegetables to chicken to prawns and back again. It can be adapted as much or as little in the way of meat as you like but is also delicious as a vegetarian option by loading up the veggies. I like to serve it in the middle of the table as it can look really quite impressive and that way everyone can help themselves- I can guarantee that there will be no leftovers! 1. Take a large non-stick frying pan and heat oil over a medium heat. When hot, add the chicken and chorizo and cook until the chicken is browned off and the chorizo is starting to turn golden and crisp. Remove from the pan and set aside but keep the delicious juices. 2. Add the onion, celery and pepper to the pan and fry until softened. Near the end add in the garlic cloves so they don’t catch. Stir through the mix of paprika, cayenne, oregano and thyme and cook for a further minute. Add the chicken and chorizo back to the pan and stir well to coat the meat with the spice mix. 3. Add the uncooked rice in and stir to combine with the rest of the ingredients. Add in the chopped tomatoes and half of the chicken stock next and bring the pan to a simmer. I also added a handful of halved cherry tomatoes for an extra sweetness against the spice but this is optional. Pour in the remaining stock gradually so the rice has time to absorb the stock and so it doesn’t start to dry out. This will need to simmer for 30-40 minutes until the rice is tender- some rice may take a bit longer than others so do keep checking and tasting as you go. If the jambalaya looks like it’s a little dry then add a bit more hot stock. 4. When the rice is tender and the stock has been absorbed, add in the raw prawns and spring onions and cook until the prawns are cooked through and tender. Serve the jambalaya in warmed bowls and dig in! A spicy jambalaya- perfect for the ever-changing weather until we wait for the summer that we were promised! When you think of fried chicken there is a good chance that you conjure up an image of a bucketful of the stuff that smells appealing but is nothing more than a soggy disappointment when you bite into the seemingly crisp exterior. The chicken itself is not always much better, with the quality being substandard and decidedly dodgy! Well fear not- this chicken lives up to all expectations time and time again! Make a weekend feast of it by serving with corn on the cob that is dripping in a lime, chilli and smoked salt butter and a freshly made coleslaw. 1. Kick off by heating a good amount of oil in a wide non- stick frying pan over a medium heat; fill it so when the chicken is cooking it comes up halfway to each piece of chicken. As ever, keep a close eye on the oil. 2. Place the flour in one bowl, panko crumbs in another and the beaten egg in another. I crushed the crumbs a little more so some are more coarse and others are more fine to add a bit more interest to the texture of the coating. Add half of the spices and flavourings to the flour and then other half to the crumbs. 3. Take each piece of chicken, dunk to coat in the flour before transferring to the egg and then finally the crumbs. Continue until all the chicken is coated. Drop a crumb into the oil to check that it is ready to use; it’s ready if the crumb sinks before quickly returning to the surface. Fry in small batches whilst keeping an eye that the oil does not start to smoke. Fry for a couple of minutes on each side before using tongs to turn them over. When the chicken is golden and crisp, remove from the pan and rest on kitchen paper to absorb any excess oil. Continue until all the chicken is cooked through. Serve immediately. Crunch spicy fried chicken- finger licking awesome! Muffin tin fritattas are as the name suggests- mini fritattas that are made in muffin tins! They are great for picnics, lunchboxes for work or school and even breakfast. 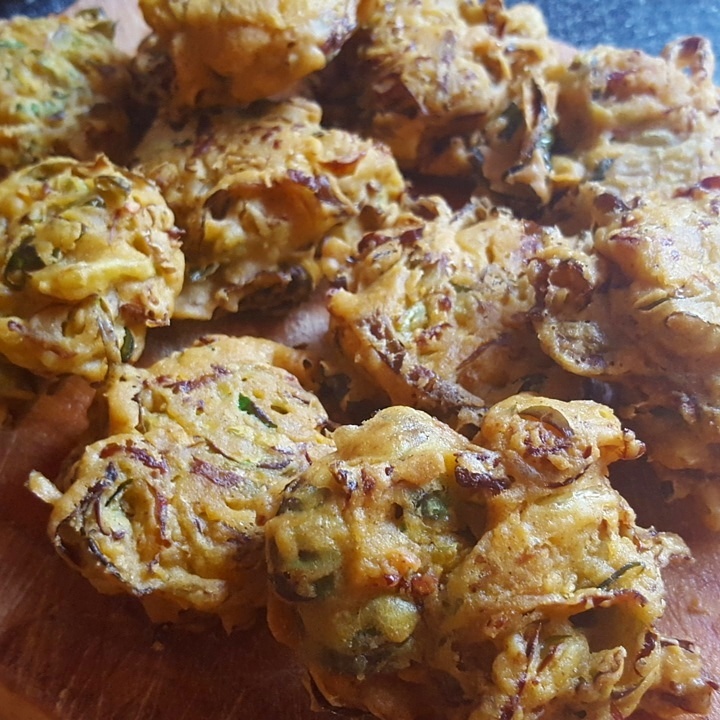 Fritattas are an ideal go to spring or summer recipe and they can be useful to use up any vegetables or cheese that is in the fridge but has started to see better days. For this recipe I used a combination of chorizo, manchego and roasted red pepper so pack them with flavour but also to give them appealing colour. They are delicious warm from the oven or at room temperature. They can keep in a well sealed container in the fridge for a couple of days- if they’re not all devoured before then! 1. Preheat the oven to 190c/ 170 fan. Prepare the muffin tin by lightly brushing each hole with vegetable oil using a pastry brush. 2. Peel and slice the chorizo into slices and then quarter each slice. Heat a dry frying pan and fry over a medium- high heat; fry the chorizo until golden and remove from the pan. Add the red onion in and fry until it has softened. Set aside and allow to cool. 3. Take a large bowl and crack all the eggs into it. Lightly beat them with a fork. Add the sliced red pepper and grate 100g of the manchego into the egg. Tear in some fresh basil and add the onion and chorizo. Season well with pepper and a small amount of salt. 4. Carefully use a ladle and divide the mixture between the 12 muffin tin holes. Do not fill them to the brim as they will naturally rise during cooking. Grate a little more manchego on the top of each hole and bake in the oven for around 15 minutes or until the egg has set and the fritattas are golden. Remove from the oven and set aside to cool. When cool remove the fritattas from the tin; you may need to loosen them a little by carefully running the blade of a small, flexible knife around the edge of the tin holes. Serve by themselves or with a simple salad. Muffin tin fritattas- your answer to breakfast, lunch or dinner! Mee hoon goring may not be a dish you’ve heard of before but, once acquainted, it is certainly a dish you want time and time again. It comes from Malaysia and is a super savoury noodle recipe. As it is so versatile you can play around with the main ingredients, be it pork, prawn or chicken to satisfy everyone but making it vegetarian by adding in even more vegetables is equally delicious so there really is no excuse for not making it. Mee hoon goring calls for a base paste that can be made in larger quantity and then kept in a sealed container in the fridge for a week or so. To add another layer of flavour and texture you can serve the noodles topped with crispy shallot ring; simply shallow fry sliced shallot in oil until golden and arrange on top. 1. Start off by making the paste. Simply combine all the paste ingredients plus a pinch of salt in a small blender or pestle and mortar and blend (or bash!) to a coarse paste. Add a splash of water to loosen it and set it aside. 2. Take a large pan and fill with boiling water. Add the chunks of pork belly and boil for 2 minutes to remove any impurities; remove carefully using a slotted spoon. Rinse the pan out, add a splash of oil and heat to medium- high. Add the pork belly to the pan and fry until golden. Remove and set aside. 3. Next up, make the sauce for the pork belly by combining the dark soy, rice wine vinegar and honey in a small non- stick pan. Simmer until reduced and thickened and add to the pork belly. Continue to cook on a lower heat until the pork is caramelised and sticky. 4. Meanwhile you can make the base of the noodles. Soak the noodles in hot water according to the packet instructions before draining well. Heat a glug of oil in the wok and fry off a generous tablespoon of the paste you have already made. Fry until fragrant but keep it moving so it does not catch on the bottom of the wok. Add the cabbage and carrot and fry until starting to soften. Add a tablespoon each of kecap manis, oyster sauce and a splash of water, stir well to combine. Making sure the noodles are well separated and add to the pan along with the pork belly which is now nice and sticky; cover the pan and cook until warmed through. Towards the end of cooking sprinkle in the spring onions so they retain some crunch. Serve immediately. Mee hoon goring- a new noodle dish to add to your repertoire! The weather is starting to hot up and thoughts start turning to lighter meals to enjoy al fresco (well, hopefully if this lasts!). If a Greek salad and Italian panzanella had a lovechild then this salad would be the result. It packs a punch and combines savoury, crunchy and satisfying ingredients to create a healthy but filling salad. To be honest this is a great meal to use up whatever salad vegetables may be lurking in the fridge as you can’t really go wrong. This salad is ideal to take on a picnic as you can make the main elements and then assemble it at the last minute to avoid soggy bread disasters or make a big bowl of it to serve at a BBQ to eat with grilled meats or fish. 1. Preheat the oven to 150c/ 130 fan. Place the chunks of bread on a baking tray so they are arranged in a single layer. Drizzle with a little olive oil and bake until slightly golden and crisp around the edges. Remove and set aside. 2. Meanwhile, prepare the tomatoes. Cut them into a combination of halves and quarters and place in a bowl. Add the sliced onion along with 2 tbsp of red wine vinegar and 3 tbsp olive oil. Season well and set aside to infuse. 3. In another bowl, combine the cucumber, feta, olives and oregano along with a good crack of black pepper and another tablespoon of oil. 4. Choose a suitable bowl in which to serve the salad and add half of the bread into it before adding the tomato mixture, cucumber mixture and tossing well. Add the remaining bread. Serve with an additional sprinkling of parsley and allow to stand for a few minutes before serving so the brad can soak up the juices from the tomatoes. Ultimate summertime salad- I promise you you’ll be making this time and time again! Now here is a recipe that is too good not to share- my garlic, herb and lemon slow roasted lamb. This can be used for either lamb leg or shoulder and it is ideal for a lazy Sunday roast dinner or for entertaining. Lamb is now in season in the UK so it is the perfect time to get your hands on some and make the most of it. I recently cooked this for Easter lunch and it went down a storm! For 4 people I used a half leg of lamb which meant that everyone was well fed but there were certainly no leftovers! If you have large appetites, want leftovers or if you are feeding the 5,000 then by all means use a larger joint and cook for longer until the meat is falling off the bone. If you have time then you can prepare the lamb the night before you want to start cooking it by following the first step, covering tightly and leaving in the fridge to allow the flavours to infuse. 2. Preheat the oven to 140c/ 120 fan. Pour the water or wine, depending on what you are using, into the tray. Cover tightly with foil and place on the middle or low shelf in the oven and cook for around 4-5 hours. The time will depend on the size of the joint so check and baste from time to time. If the bottom of the tray becomes too dry then add another splash of water. When the lamb is nearly ready, remove the foil and allow the lamb to catch some colour and turn golden. The juices should run clear and the meat should come away from the bone with ease. Remove from the oven and rest whilst you make other accompaniments. Garlic, herb and lemon slow roasted lamb- a sure fire crowd pleaser that’s packed with flavour but that needs very little care! Now here is a feast that is fit for a Friday, Saturday, Sunday… or any day for that matter! Beef brisket is my favourite cut to use for a chilli as it holds the flavours of the spices amazingly well and slow cooks like a dream so you are left with a melt in your mouth chilli. I have kept the chilli recipe as simple as possible so it will be perfect served with a range of things from nachos to rice but feel free to use it as a base and add in extra vegetables or beans. Play around with your choice of chillies; I used ancho and chipotle morita to add a kick of heat whilst also adding a wonderful smokiness. If you prefer your chillies a touch milder then use whatever chillies suit you. Cheddar or Monterey Jack cheese as much as you dare! 1. Preheat the oven to 150c/ 130 fan. Choose a large, lidded, heavy based casserole dish and heat half of the oil over a medium- high heat. Season the brisket and brown it on all sides before removing from the pan. Drain off any excess fat and add a little more vegetable oil. Lower the heat and fry the onion and garlic together for a few minutes until softened. 2. Sprinkle in the spices and herbs and stir well to combine with the onion and garlic. Cook for an additional minute or two. Pour in a splash of the beef stock to remove any pieces of onion that may have caught to the pan slightly. Add the remaining stock and passata along with the dried chillies; bring to a simmer and add the brisket back to the pan. Pop the pan into the oven and cook for around 3-4 hours or until the brisket is meltingly tender. If the chilli looks like there is still a lot of liquid you can either remove the lid and continue to cook it or put it on the hob and simmer to reduce and thicken. 3. When ready to assemble the nachos, simply use two forks to pull the brisket apart. Take an ovenproof dish and layer with tortilla chips, salsa and some sliced fresh jalapenos. Sprinkle a little cheese before repeating. Add the chilli on top of the seond layer of nachos, add more cheese and bake in the oven for 10-15 minutes at 200c/ 180 fan until the cheese is bubbling and melted. Finish with a handful of freshly chopped coriander and some more fresh jalapeno. Chilli beef brisket nachos- ultimate comfort food perfect for a quiet night in or a party! The term ‘fry up’ conjures all sorts of images of greasy spoon cafes offering calorie laden breakfasts with tea so strong that you can stand a spoon upright in it but this is a completely different take on this. Rather than a meat heavy breakfast this makes the best of two of my favourite things which are both in season in the UK at the moment- Jersey Royal potatoes and asparagus. Each year I eat the best part of a family’s asparagus quota to myself and I hope this year will be no exception. My tray bake ‘fry up’ is much lighter and healthier than the usual fry up but it is perfect not only as a breakfast but also as a brunch or even a midweek dinner. It’s speedy but also is low on washing up which is always a bonus in my mind! Jersey Royals- as many as you want depending on hunger! 1. Start by preheating the oven to 200c/ 180fan and bringing a medium pan of water to the boil. Take the tray that you will be making the majority of the meal in, add a splash of oil and heat on the hob over a medium heat. Meanwhile simmer the potatoes until just tender; drain well. Take a separate tray, add another small glug of oil and toss the potatoes in it. Season with salt and pepper and roast until golden whilst you crack on with the rest. 2. When the oil is warm, add the onions and garlic and fry until softening. Shred the spinach and add to the tray; stir until combined with the onion and garlic and continue to cook over a lower heat until wilted. Remove from the hob whilst you assemble the rest. 3. When the potatoes are golden, use a slotted spoon to remove from the tray and use the back of a fork to lightly crush them. Add the asparagus, tomatoes, mushrooms and potatoes to the pan. Sprinkle with chilli flakes and season well. Brush the vegetables with a light coating of oil so they don’t catch in the oven and bake until just tender. Make a couple of hollows in between the vegetables and crack an egg into each; return the tray to the oven and cook until the eggs are set. 4. While that is in the oven, fry the streaky bacon in a dry pan or even wipe out the tray that you used to roast the potatoes and use this on the hob to minimise washing up further! Streaky bacon has a high fat content so you won’t need any extra oil. Fry until golden and remove from the pan. Towards the very end of cooking you have a bacon related decision to make… You can either serve the bacon on the top of the tray bake in whole rashers or you can do as I did and crumble a couple over the top whilst keeping a couple whole so it’s up to you. Serve immediately. Tray bake ‘fry up’- just as delicious but minus the calories! Sweet and sour pork is one of the mainstays of most Chinese takeaways and restaurants and is known and loved throughout the land. There’s only one snag though- it’s rich often cloying batter so I decided to give the dish a revamp and lose the batter but not compromise on flavour. If you know me, I am not a huge fan of fruit in savoury dishes, but the pineapple in this dish is a must as it balances the flavours and is deliciously tender. If you prefer, you can substitute pork with chicken. 1. Kick off proceedings by combining all the sauce ingredients in a small pan and heat over a low heat until starting to thicken; remove from the heat whilst you start the pork. 2. Take a pan that you can shallow fry in and add enough oil; heat to medium- high. In a couple of batches, fry the cornflour flour tossed pork until golden. Remove from the pan using a slotted spoon, blot onto kitchen roll to remove excess oil and set aside. 3. In a wok, add a glug of oil and fry the pineapple and peppers until softening and until the pineapple is picking up a little colour. Pop the pork in the wok and cook for a further couple of minutes before adding the reduced sauce. Continue to cook until well combined and the sauce is coating each piece of pork. Serve immediately with rice or noodles and dive in! Sweet and sour pork- not a scrap of batter in sight! In the modern world, we are constantly bombarded with messages of healthy eating, clean eating (no phrase annoys me more!) and food fads but sometimes we all need proper comfort food. It’s a time to forget calorie counting once in a while and eat what makes you happy and cauliflower cheese is definitely one of those meals! Cauliflower cheese needs no introduction as it is exactly what it says it is- no pretention! It can be the main event or a side dish for a whole host of dishes. It also allows you to play around with a mixture of cheeses to make it as savoury as you want and cheese sauce is also a perfect way to use up any odds and ends of cheese that may be lurking in your fridge. In this recipe, I have given you the basic cheese sauce recipe that I use but feel free to add blue cheese if you like as cauliflower can stand up to the sharpness of it. Fried off cubes of pancetta are also a welcome addition! 1. Kick off by preparing the cauliflower. Clean it and cut into large florets. Bring a large pan of salted water to a boil and boil until the stems are just tender- it will continue to cook when it is baked so it needs a bit of texture still at this stage. Drain well and set aside while you make the sauce. 2. For the cheese sauce, use a pan and heat over a medium heat. Melt together the butter and flour to form a roux. Gradually add in the milk and cream; making sure you keep stirring to ensure that no lumps form. If any lumps start creeping in then remove the pan from the heat and whisk it like your life depends on it before returning to the heat. Continue to stir and simmer until the sauce thickens. Remove from the heat and add in the parmesan and season to taste. 3. Choose an ovenproof roasting dish that will fit the cauliflower in a single layer. Arrange the florets and pour over the cheese sauce. Top with grated cheddar and a little extra parmesan if you like. Bake at 200c/ 180 fan for around 30 minutes or until golden and bubbling. Serve immediately. Cauliflower cheese- like a cheesy hug for soul! ‘Heady’, ‘aromatic’ and ‘fragrant’ are words that could be used to describe Middle Eastern spices and they lend themselves perfectly for spicing up vegetable dishes. This Morrocan chickpea and vegetable pie is a great way to get some of your five a day and I promise you that you won’t regret it. Make the pie filling in advance if you like to allow the flavours to develop even more- it can even be frozen. The pie can be enjoyed for dinner but also keeps well for lunch the next day. 1.Get going by taking a large wide pan (with lid) and add a glug of olive oil over a medium heat. Add the red onion and cook until softening before popping the garlic in with it for a further minute or two. 2. Next in goes the squash, chickpeas and red pepper. Sprinkle over the cumin, coriander and spoon in the harissa. Pour in the stock, cover the pan with the lid and lower to a simmer. Cook until the squash is tender to a knife point. The liquid should be well absorbed but if there is some left then remove the lid and simmer for a further time so a light sauce is left. Shred the baby spinach through and wilt. Taste and season well; add some further spice if you like. Remove from the heat and allow to cool. When cool, crumble through the feta. 3. Preheat the oven to 200c/ 180 fan. Choose a pie tin that is approximately 20cm wide. Lightly brush the inside of the tin with some of the melted butter. Layer the tin with a sheet of the filo before brushing with a little more butter before placing a second layer in and repeating. Spoon in the cooled pie mixture. Bring the sides of the filo up and into the centre of the pie tin before finishing with more butter. If the filo sheets do not meet perfectly, take another sheet of the filo, rip it, scrunch it and place on the top. Bake for 20-30 minutes or until the filo is crisp and golden. Serve with a simple salad. Moroccan chickpea and vegetable filo scrunch pie- spice up your week! This puff pastry tart makes the most of the seasonal produce around at the moment. The wild garlic and asparagus season in the UK is short so now is the time to get your hands on them and get cooking. Wild garlic is as it sounds- wild! You can forage it (if you’re sure what you’re looking for) but can now be found in some farmers markets or specialist grocers. It can be used in a range of dishes and pesto is only the start and even this can be picked up premade. Failing this, substitute this with a different pesto of your choosing. To ramp up the flavours in this tart, I have also used some Parma ham which I crisped and crumbled over the top for an extra element and texture. 1. Get going by preheating the oven to 200c/ 180fan but do check the instructions on the pastry packaging in case this differs slightly. Take the sheet of pastry and place it on a work surface. Leaving a border around the edges of the pastry sheet, use the prongs of a fork to lightly prick the centre of the sheet. This will stop the centre of the pastry from puffing up but will let the edges do so. 2. Take the pesto of your choice and spread this in the centre of the pastry. Make sure this is as even as possible. Lay each asparagus spear on the pastry and scatter pieces of the cheese in amongst them. 3. In a small pan dry fry the parma ham slices until crisp. Remove from the pan and set aside for a moment; you will find that as they cool they go even crispier which makes the slices much easier to crumble or you can use a knife to roughly chop into smaller pieces.I added the ham topping towards the end of cooking so it didn’t catch..
4. Lastly, use a pastry brush and carefully glaze the edges of the tart with the beaten egg. This will give a wonderful sheen and shine to the tart. Cook the tart for around 20 minutes until the asparagus is tender and the pastry is golden. About 2-3 minutes before the pastry is ready then sprinkle over the parma ham before finishing off. I served this with a simple side salad and new potatoes. Jersey Royals are bang in season so look out for these too. Boil and toss with some butter and fresh herbs. Wild garlic pesto, asparagus and goats cheese puff pastry tart- a light way to use the best of spring’s offerings! Chimichurri surf and turf is the perfect meal for sharing with a table of friends and family and it really does take very little effort. The quantities of steak and prawns are merely a guide so adjust according to appetite! The chimichurri can be made in advance, covered and stored in the fridge until you need it. Chimichurri should have a kick whilst still being able to taste the herbs and other ingredients so aim for a perfect balance. Use the best prawns you can find and afford as the flavour will be unrivalled. Eating shell on prawns can be a fun but messy affair so provide finger bowls for your guests too. 1. To make the chimichurri, blitz the parsley, garlic, shallot, chilli, oil, lemon and vinegar in a processor so grab your pestle and mortar and give it a good old bash! Set aside until ready to use. 2. When you are ready to cook the steak, take a griddle pan and heat until smoking hot. Season and lightly oil the meat and cook to your liking. I allow 1 minutes each side for your average size sirloin for rare but cook according to your tastes. Remove from the pan and allow to rest. 3. Whilst the steak is resting, cook the prawns. Take a frying pan and heat a glug of oil. Cook the prawns until pink and cooked through. Use some of the chimichurri and toss well to coat the prawns. When the steak is ready, cut into slices. Take a large serving platter and scatter the salad leaves. Place the steak on the platter and spoon over some of the chimichurri before arranging the prawns around. Finish off with more of the chimichurri and serve immediately. Chimichurri surf and turf- a treat fit for any occasion! Spicy Korean chicken is the ultimate in Asian comfort food. Sweet, spicy and savoury flavours make them one of the most moreish dishes which is perfect for a quiet night in or a party with friends. Just be prepared for them to go down a storm so make more than one batch! Allow a little time for the chicken to marinade in the fridge before you need them so the flavours have time to infuse. The recipe can easily be multiplied depending on how many guests you are feeding and can be used for a whole range of chicken pieces from drumsticks to thighs to wings so get cooking! 1. Crack on with the marinade in advance by simply combining the soy, honey, rice wine vinegar and gochujang. Simple! Place in a bowl or in a zip lock freezer bag along with the chicken pieces and make sure they are well coated. Chill in the fridge until you need them. A couple of hours is good but overnight is even better if time allows. 2. When you are ready to cook them, they will take around 20-25 minutes in the oven on 200c/ 180 fan. Make sure the chicken is cooked through and the juices should run clear when it is ready. Reserve the marinade and place in a small pan on the hob and gently heat until it begins to thicken. When it is ready brush the chicken drumsticks with the thickened sauce on each side before giving one last minute in the oven. You can also finish them off with a sprinkle of toasted sesame seeds if you like. The marinade makes the chicken deliciously sticky and irresistible. That’s all there is to it! Spicy Korean chicken drumsticks- grab a pile of napkins and dive in! Picture the scene: you’re at home, working for the day perhaps, and your stomach starts rumbling mid- afternoon but, alas, there are no snacks in the house! What are you going to do? Make these smoky and spicy roasted chickpeas of course! In a time where people are more and more health conscious and it’s all about getting your five a day, it can be hard to think of delicious and nutritious snacks but look no further! This is a cheap, easy and relatively quick snack to make that can be made in advance and stored so it is on hand for whenever hunger pangs take hold. If you’re eating them hot from the oven, a little squeeze of lemon juice also lifts the flavour so do give this a try! 1. Preheat the oven to 200c/ 180 fan. Take the tin of chickpeas and drain them well. Rinse thoroughly with water and pat dry using kitchen roll. Place on a single layer on a baking tray. 2. Drizzle over a good amount of olive oil, about a tablespoon should do, and toss to coat the chickpeas. Sprinkle over the chilli, cumin and coriander before finishing off with a good pinch of sea salt. Roast in the oven for around 40 minutes, checking them from time to time and tossing. Some chickpeas will have more moisture in them than others so these may take slightly longer. Just be careful the spices do not catch or burn so keep your eye on them! Adjust salt to taste. Serve warm from the oven or allow to cool and store in airtight containers until you want them. Smoky, spicy roasted chickpeas- give your snacks an overhaul this year! 1. Take a small pan and add the dark soy, rice wine and cornflour in water. Heat over a medium heat for a minute or two until if starts to simmer. Pop in the chilli, garlic and ginger and continue to simmer until the sauce is thick and glossy. 2. Lower the heat and add in the raw prawns; toss to coat in the sauce. Cook for around 3-4 minutes until pink and cooked through. Serve immediately. If you’re anything like me, over Christmas you have seen cooked and eaten enough meat to last a lifetime, so by the time January hits you are ready for a change andthis is where these spiced chickpea and lentil burgers come in! These bad boys prove that you don’t need a beef burger to satisfy you. They are also suitable for vegetarians and vegans so there is no excuse not to whip up a batch! These are gently spiced with a nod to Middle Eastern flavours but make them as mild or as spicy as you like. I served these with skin on potato wedges and an array of burger toppings such as salad (for the health conscious), harissa mayonnaise (for the spice lovers) and tzatsiki ( to cool and refresh). This recipe does not use egg to bind the chickpeas and lentils however if you find the mixture needs a bit of help to come together then sprinkle a little flour into it. Work the mixture with your hands and it will bind perfectly well. An egg would make the already moist mixture too wet and sticky so don’t be tempted to add one! 1. Kick off by draining the tins of chickpeas and lentils and giving them a quick rinse. Place in a food processor along with all the other ingredients apart from the oil and flour. Blitz so the chickpeas and lentils are coarse and have retained some texture. 2. Lightly dust a chopping board or work surface with some plain flour. Divide the blitzed chickpea mixture into four and form patties. Place on a tray, cover them with cling film and chill in the fridge for half an hour to firm up. 3. Take a non- stick frying pan and heat a good glug of vegetable oil over a medium to high heat. When the oil is warmed, place the patties in the pan and fry for around 10 minutes before flipping over carefully and frying for a further 10 minutes. Fry until golden and crisp. Serve in lightly toasted burger or brioche buns with all the trimmings. Spiced chickpea and lentil burgers- all the flavour and not an ounce of meat in sight! Paneer is an Indian cottage cheese that is so versatile and can be used in a whole host of dishes however, sometimes, only a curry will do. I have written this recipe to be medium heat but of course if you are a chilli fiend then simply add in some extra along the way. After a festive season of excess and plenty of meat this recipe is a welcome break from heavy meals. Of course, if you can’t stand to wave goodbye to meat then this curry is perfect for chicken. I have kept the curry is purposefully light and fresh so the paneer is packed with flavour but not swimming in sauce. If, however, you want a curry that is saucier then you can add more tomatoes and reduce it less. 1. The first thing you will need to do is soak the dried Kashmiri chillies for a little while- around 20minutes will usually do the trick. Whilst they soak you can make the curry paste; simply combine all the remaining ingredients in a small bowl and add a splash of water to bring the paste together. Set aside. 2. In a large bowl, toss the paneer cubes with the cornflour and a little seasoning. Heat a good glug of oil in a non-stick frying pan and heat to medium-high. Fry the paneer on each side until golden and crisp before removing from the pan and blotting onto kitchen paper to remove any excess oil. Take a third of the curry paste and toss through the paneer. Use a little more kitchen roll to wipe out the pan and add another glug of oil before turning the heat down to low. 3. Add the sliced onion to the pan and cook until softening. At that stage add the mustard seeds, ajwan seeds and cook for a further couple of minutes.Stir through the remaining curry paste. Pop in the chopped bell peppers and continue to cook for a few minutes. If the pan starts looking a little dry then simply add a splash of water and mix it through the onions and peppers. 4. Add the chopped tomatoes to the pan, an extra splash of water and simmer until the tomatoes start to break down and reduce. Don’t be tempted to rush this as the longer it has the richer the sauce will be! When the curry is a few minutes away from being ready, take the marinated paneer and roughly chopped spinach and add to the pan. Continue to cook, stirring occasionally, until the paneer is warmed through and the spinach is wilted. Sprinkle over the garam masala and stir to combine. Serve the curry in warmed bowls with rice or flatbreads on the side. A liberal helping of coriander to finish the dish is optional! Paneer, pepper and spinach curry- a great way to start the New Year, plenty of flavour and no turkey in sight! Before thoughts turn to Christmas food and festivities, there’s time for one more recipe to get you through once you’ve had enough roast potatoes and sprouts! This squash and blue cheese bake is simple and can be made in advance so it is perfect for a casual dinner as well as if you’re entertaining. I have used coquina squash for this which makes a change to the usual butternut squash. Coquina squash is slightly more sweet and the flesh is soft and tender which lends itself perfectly for roasting. To offset the sweetness I have used a creamy blue cheese and some salty pancetta to give the dish a lift. I served this in individual dishes but you can make a larger one if you prefer. 1. Get going by preheating the oven to 180c/ 160 fan ready for roasting the squash. Use a sturdy sharp knife and halve the squash lengthways. Scoop out the seeds, drizzle with the olive oil and place one garlic clove in each of the hollows. Roast for around 50 minutes or until tender. When the squash is ready, use a spoon to scoop out the flesh and place in a bowl. Squeeze out the roasted garlic and add to the bowl with the squash. Use the back of a fork to mash it down until smooth and set aside whilst you make the base for the sauce. 2. Bring a large pan of water to the boil and cook the pasta until al dente as per the packet instructions; drain well and set aside. 3. Use a medium sized saucepan and add the flour and butter. Heat gently so the butter melts and combines with the flour to make a roux. Gradually pour in the milk and cream, stirring all the while so no lumps form. Increase the heat a touch and keep stirring until the sauce thickens. Remove the pan from the heat and add the blue cheese as well as most of the cheddar and parmesan (reserving some for the topping). 4. Take a frying pan and heat on a medium- high heat. Place the slices of pancetta in the pan and cook until crisp. Roughly chop the pancetta and add to the sauce. Add the roasted squash flesh to the sauce and stir well to combine. Stir the sauce through the cooked macaroni and place in an ovenproof dish or individual dishes. Top with the remaining cheese. Bake for half an hour or until golden and bubbling. Serve with a simple side salad. Squash and blue cheese macaroni bakes- a twist on a well loved classic! Sea bream is one of my favourite fish so there’s nothing better than pairing with other fresh ingredients to bring out the flavour of it. This recipe does not require a huge amount of ingredients so it is simple to achieve when you want something delicious but without the faff! For ease I have cooked the dish in the oven to make sure the fennel is well roasted which brings out the sweetness however it could also be made on the hob top if you prefer. 1. Preheat the oven to 180c/ 160 fan. Take an ovenproof wide bottomed pan and heat the oil in the pan in the oven. Season the potato slices add to the pan and roast in the oven until turning golden and tender; this may take a little while so take your time and check them from time to time. Reserve the fennel tops and set aside. 2. Add in the onion and fennel slices continue to cook until both are softened. Roughly chop the pancetta and add to the pan; cooking until crisp. Take a frying pan, add another small amount of oil and heat to medium- high; season the sea bream fillets and fry skin side down for a couple of minutes until the skin is crisp. Remove from the pan and place on top of the potato, onion and fennel. Cook for around 10 minutes until cooked through. Take the reserved fennel tops and scatter. Squeeze the lemon juice over before serving. Sea bream with fennel, onion and pancetta- make the most of fresh ingredients with this simple supper! Pilaf is a spiced rice based dish that is common across the world and can be packed with a whole range of ingredients, from vegetables to meat to fruits and everything in between. I have used a vegetable pilaf here to pair with the richness of the duck which is glazed with honey and pomegranate molasses. Pomegranate molasses gives a sour edge so you have different layers of flavour running throughout the dish to give a balance. 1. Get started by seasoning the duck legs with salt. Combine the molasses, honey and oil and brush onto the duck legs so they are well coated; set aside. Preheat the oven to 180c/ 160 fan ready for the duck later on. 2. Heat the oil for the pilaf in a wide pan and bring it up to a medium heat. Add the chopped onion and garlic; cook until softening. Next up goes the aubergine and carrot and, again, cook until softening. Sprinkle over the spices and stir well to combine. 3. Pop the duck legs on a wire rack and cook for around 35-40 minutes until the juices run clear. The time may need to be adjusted depending on the size of the legs. 4. Meanwhile, add the rice to the pan and add the stock little by little as it is absorbed a bit like you do when you cook a risotto. Continue to do this until the rice is cooked and tender. `Check the levels of spicing as you go and adjust to taste. 5. When the duck is ready, rest it for a while to help the juices reabsorb which makes sure the meat is really tender. Finish off the pilaf with the freshly chopped herbs and serve. Honey duck with vegetable pilaf- spice up your life!